This has to be done anytime between three months and 15 days before your wedding date. From what I’ve read in the guidelines, though, 15 days might be cutting it too close, so try to get it in earlier if you can. The guidelines suggest that you don’t delay giving notice just because you’re waiting on accompanying documents to come in; it might be better to give notice first then supply your documents to the registrar at a later date. I haven’t been able to locate the forms for giving notice if you are getting married in England and Wales. You should go to your local register office (assuming you are in the UK). I’ve been told that you can’t give notice at every register office, but they can direct you to the one you should go to. The documents that you need to take with you are listed here. The witness forms that you also have to fill (although I don’t think it follows the same deadline) for getting married in Scotland can be found here. If you are planning to settle in the UK after marriage, you’re going to need a visa to enter the UK as a fiancé(e) or proposed civil partner. Unfortunately, I don’t have any experience of this, which I understand is a complicated, even painful, process. Hopefully one day there will be another post that can go into this process. The visa allows you to stay in the UK for up to six months, and costs £83. The form is more tedious than difficult. There used to be an online link to it but it seems to have been changed. 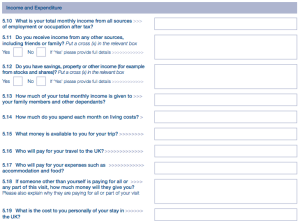 But just to give you an idea, I had to fill in questions relating to where I have travelled to in the past 10 years, my monthly income, my monthly expenses, any savings or other forms of income, who I will be staying with and how I will fund my trip/accommodation/food. It also asks you about the expiry date and number of your previous passport (if you have one), which was awkward for me because I have no idea where my old decommissioned passport is. I told the officer at the visa office that and she didn’t seem to think it mattered. Apart from this form you need to supply some documents to back up your application. There is a guide to supporting documents here. You’ll need bank statements; I was told at least six months’ worth. You also need a passport photo, and obviously, your actual passport. Be careful if you’re planning to travel anytime soon, because they will hold your passport while your application is being processed, and as I said, that can take up to 15 working days. Details of your itinerary are optional; it doesn’t really make sense to be able to provide a confirmed itinerary if they also advise you not to confirm any bookings or make any payments for flights and accommodation until your visa is approved. The rest of these documents are optional, but were suggested by the lady at the visa office who thought it might strengthen my application: some sort of proof that a wedding/marriage ceremony is being planned and a letter from my fiancé supporting my claim that I am getting married. None of this is specified on the website but were just ideas that she was throwing out that she thought might help. I ended up bringing: bank statements (six months), a cover letter explaining my freelance status, proof from Singapore’s Registry of Marriages that there is no impediment to my getting married, correspondence with the wedding photographer to prove that I’m planning a wedding. For good measure I gave them a wedding invite. I will update this post to let you know if they show up for the wedding. Right now I’m waiting for my passport to get back to me. I don’t really anticipate any problems, but you never know, so fingers crossed! I also got a bill of S$41 for my phone call with the UK Visa helpline. Poo. I can understand your frustration. I have been through the visa process and it’s not pleasant. I first applied for a unmarried partner visa from singapore in 2009 and was rejected. I decided not to go tribunal then. For that application, I got myself a UK immigration solicitor but I think my application just wasn’t strong enough. At least, not to their standards. As a workaround, I applied to do my Masters in London. I’ve always wanted to do that anyway, plus that was one way to be with my partner. Yes, you can be rejected for one visa, but they can approve another type of visa if you meet those requirements. I came to UK on a student visa in 2009. Towards end of my visa, I applied for post study work. Stayed in London for 2 more years. At the end of my PSW visa, I decided that having a civil partnership was the best way forward. I got my civil partnership days before my PSW visa expired (last minute, I know). I had gathered most of my documents a couple of months before and then prayed for the best. No solicitors this time. Instead, I read the guidance and the immigration rules. They are a pain, but extremely important. By some sheer luck, I was granted leave to remain for 2.5 years, or what is known as the spouse visa. Are you trying to come into UK as a fiancé or marriage visitor visa? As far as I know, you need to give notice of about 14 days before you can be officially married at the register office. And I think you need to have resided in your local are for 7 days. But I am not sure this rule will apply to you. As for the designated local office, it appears most of the register offices in London are listed. They have one in each borough I believe and all if not most are listed as designated. The list of designated offices used to be very limited, but they have changed that. The whole visa application process is a pain. They try to make things difficult for you. And it doesn’t help that sometimes information on the internet isn’t clear or just seems to contradict. You mentioned you had to withdraw your application and start over. Why is that so? Well, if you need any help, please feel free to ask and I will see what I can find. Thanks for the comment! And thank you so much for offering help. Applying to do my Masters is out of the question because I actually *just* did a Masters in the UK (which is how we met) – to do another one would be far too expensive (and also unnecessary). The Post Study Work visa option has been cancelled, I believe. Or at least cancelled for Masters level students. If I remember rightly this was a change that came in 2012. We don’t plan to settle in the UK because work options aren’t great there at the moment so I have applied for the marriage visitor visa, just so we can get married in the UK with his family present. I was told to withdraw my application and start again because the first time I went to the visa office I was told that I didn’t have enough documents and it was suggested that it would be better to delay submission and return another day with more documents that will make the application stronger (so I don’t have to pay the visa fee again if I get rejected just because of a lack of documents). I was told that I could reschedule my appointment online at the Visa4UK website but it later turned out that I, for some reason, didn’t have that option (it just wasn’t appearing in my account). So, after an expensive call, the best solution I was given was to withdraw the application, get a refund, and do it over. I’ve since done that and submitted the application a few days ago. I’ve also been notified that the refund for the last application should be processed soon. So all I have to do now is wait for the decision and to get my passport back! Fingers crossed. I don’t really anticipate any problems; I don’t see how I could have submitted any more information! I put together this post as a way to vent some frustrations with having to deal with the system and get all confused with the rules. I thought that putting a post like this together might help others who are in the same situation, by setting down my experience and everything I know about the forms and the requirements. Hi, thank you for the post. I just wanted to know how my sponsor (UK citizen) can notify or register for marriage in advance as we are applying for fiance visa to be married once I get the visa. But one of the requirements are, you have to book your marriage in advance to poor ur intention of getting married? Thank u and i hope i was clear. For Scotland, I don’t need to personally be in the registry office. Both of us aren’t in Scotland at the moment so Calum’s mum has taken the documents in for us. I don’t know if this is possible in England or Wales, though – is that where you are? Because I don’t have any documentation to prove that we have already taken our paperwork to the registry office I just submitted my correspondence with the wedding photographer as proof that we are planning our wedding. I hope that’s good enough! I suppose I’ll have to wait and see if it worked.